A report from ABI Research estimates that Android devices held 86% of the smartphone market in Q2 2014. Of this, forked Android or AOSP devices (without Google services) accounted for 20%, while the rest were devices certified by Google (with Google services preloaded). Some analysts see this as a threat to Google and Android. In reality, there is virtually no competition between these two categories. 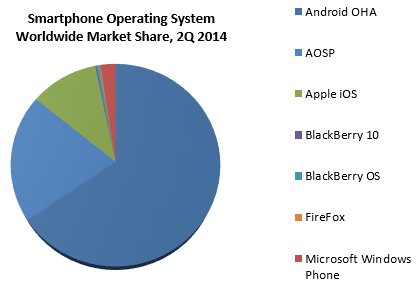 The popularity of AOSP in China just proves that there is no room for a third smartphone platform. Third party services emerged to fill Google's shoes and left no room for platforms like Windows Phone and Firefox (or even Samsung's platforms). This should prove, beyond any doubt, that AOSP is no threat to Android or to Google's business model. This isn't to say that Google's business model is invincible. Today, every single company in technology faces the threat of disruption -- Google is threatened by closed app data, Facebook is threatened by modular social apps and Apple/Samsung are threatened from below. The key is to understand the levers used to create and capture value before looking for vulnerabilities.